Nature is almost always a major component of any landscape design and this never fails to make a connection by stimulating our senses. In this new park designed by Balmori Associates, all the bodily senses of sight, touch, hearing and movement come together to deliver a powerful experience. In a car-centric city, a 1 km pedestrian loop unifies the whole site. Sections of the roof are an elevated, perforated metal path that increased permeable areas and reduced water run-off. The world’s third largest metropolis, Sao Paulo in Brazil is an urban innovation. Here, surrounded by concrete, glass, tar, metal and steel structures it is easy to forget nature. While the city’s round-the-clock pulse is a close cousin of New York’s or Tokyo’s, it seems to be missing an essential organic layer, cloaked by the urban fabric that it wears. 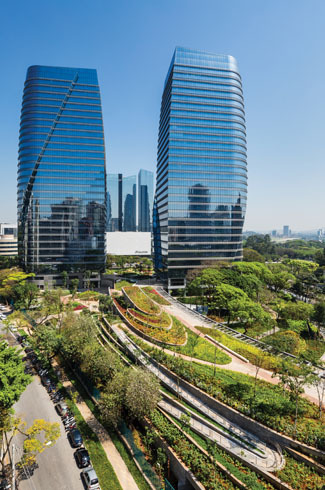 The new park designed by Balmori Associates at Sao Paulo Corporate Towers celebrates the Mata Atlantica Rainforest’s biodiversity and spatial richness in the dense concrete jungle of Sao Paulo. 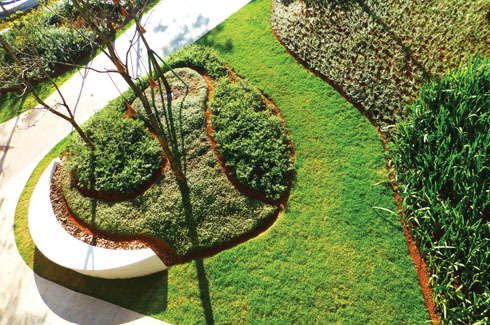 In order to incorporate nature into the urbanites’ lives the team very adeptly integrated landscape into architecture. 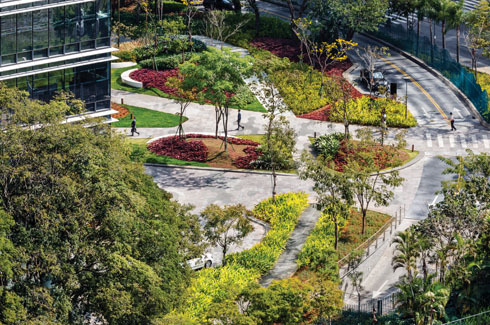 Located in the affluent neighborhood of Vila Olimpia and spread across 4 hectares, the new park designed by Balmori Associates at Sao Paulo Corporate Towers celebrates the Mata Atlantica Rainforest’s biodiversity and spatial richness in the dense concrete jungle of Sao Paulo. 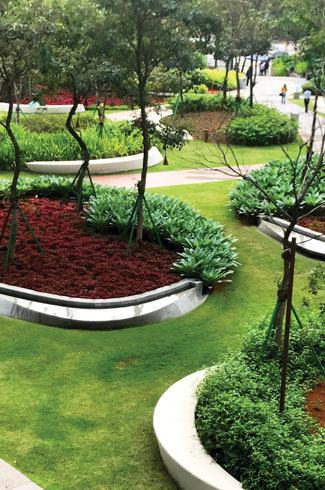 When it comes to landscape design, the question of spatial continuity always crops up. 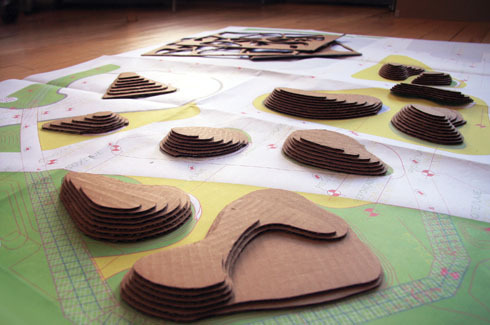 Balmori says, “To blur the site boundaries and integrate the park with the city an undulating fence curved in plan and elevation weaves through the landscape.” Driven by the character of the Mata Atlantica, the design responds to the special site location. The topography lends an opportunity to use the creation, syncopation and unfolding of space to create provocative sequences that offer surprises at regular intervals. Local nurseries proposed only a few native species. As a result, Balmori Associates reframed the planting palette to only a dozen vernacular species that included Bromeliads and Epiphytes for their lower water demand that not only helped cool the towers but also called for minimum irrigation. The architectural program consists of two 30-story commercial towers, a restaurant and a conferencing center situated on a unique site that comprises of the last piece of the rainforest in Sao Paulo. The pair of sculpted towers forms a dynamic composition which though similar in floor plans, is oriented differently from each other. The project achieved the highest environmental standard of LEED Platinum by including a high performance façade and external shading that optimizes daylight. Highly efficient lighting systems, a storm water capture and re-use system, a central cooling and energy plant and a sustainable landscape design all come together to maximise environmental performance. “The main characteristic of the project is the size and variety of the vegetation,” says Balmori. The site already had some beautiful, mature vegetation planted and the concept behind the park was directed by its very preservation and restoration. The tree tops that ended at graphical heights created magical outdoor spaces of dappled sunlight and shade, providing cleaner air and a cooler environment. Parts of the site that had to be excavated to provide for parking garages were closed by trees transplanted in the periphery of the property. Over a hundred new rainforest trees were added to the site. The local Ipe was proposed as the signature tree for the project to create a display of a dozen different species at the entrance plaza. The vibrant tree Quaresmeira or Purple Glory was also included as a delegate of this ecosystem and region. The pair of sculpted towers has a dynamic composition which though similar in floor plans, is oriented differently from each other. Native under-canopy plants were identified to form the lower layers of the forest. However, the team informs, “Local nurseries proposed only a few native species.”As a result, Balmori Associates reframed the planting palette to only a dozen vernacular species that included Bromeliads and Epiphytes for their lower water demand that not only helped cool the towers but also called for minimum irrigation. Native soils were also selected for their water retention properties. A large green roof accessible by a series of ramps becomes a link between the two towers and integrates the amenity building with a series of terraced walls. In a car-centric city, a 1 km pedestrian loop unifies the whole site. Sections of the roof are an elevated, perforated metal path that increased permeable areas and reduced water run-off. It also transformed the narrow sidewalk into a unique experience of walking amidst leafy foliage. Other sections are highlighted by contrasting Brazilian granites like Red Dragon in a pixelated field of Rosa Beatriz and Preto pavers. The buildings not only gave rise to a landscape punctuated by gardens and sitting areas, they also expanded the lifespan of the roofs by supporting vegetation and reducing noise levels. A process of photosynthesis helps clean air and water. The fountain water is reused in the lavatories and contributes to the dense vegetation and a cool microclimate. 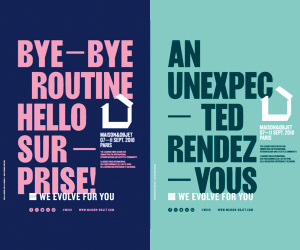 As the team puts it, “We need to create a different balance between the inert and living surfaces.” In fact the project has sparked and sustained a vision of reinventing the city by duplicating this very balance and by turning Sao Paulo Corporate Towers into its very fulcrum.